Camping Michelangelo, overlooking the Florence skyline a shot bus ride from the center—but sadly now closed.When I was ages 11 to 13, my family camped its way across Europe (we were living in Rome at the time—heck, for a few months we actually lived in our RV in a Roman campground). We spent long weekends and summer breaks traveling the continent by campervan, hobnobbing with the types of Europeans who had ditched minibars for camp stores, and traded pillow mints for tent poles. Some of my favorite European memories came from camping, whether it was watching a meteor shower from the banks of the Thames (up-river from the bright lights of London), battling a German-speaking washing machine in Northern Italy (turned out to be a dryer, so our clothes camp out very warm, unwashed, yet full of soap powder), or taking in the sunset panorama of Florence from a plateau in the Oltrarno where we had arrived early enough to secure one of the sites along the front edge of the vast parking lot of a campground known as Campeggio Michelangelo (sadly, recently closed). But beyond the ogling, it truly is a chance to hang out in a totally non-touristy context with some bona fide Europeans, sharing travel advice along with your pickled wieners, making plans together to take a short hike in the Dolomites next morning, and just generally trying not to stare at the exposed chest of the wife of your new friend Günther. Brush up on your German; Italian campeggi are packed with campers from Teutonic countries. As in the U.S., Europe is suffering from the same trend away from car/tent camping in favor of RVs and campervans. Like their beaches, Italian's organize campgrounds in regimented rows. Camping Marina di Venezia, sleeping up to 12,000 campers by the beach on Punta Sabbioni, a short vaporetto ride from downtown Venice .While there are loads of Italian campgrounds out in the sticks for the get-back-to-nature crowd, there are also plenty of places to pitch your tent in and around the major cities, usually right near a bus stop. That said, by their very nature most campgrounds tend to be on the edges of cities, so expect a healthy 30-45 minute bus ride into the heart of the action. Camping in Italy is also pretty darn cheap (the biggest attraction, really). It generally costs anywhere from $15 to $50 for two people and a tent, sometimes a wee bit more if you are in a popular area (near a major city) or have a campervan. Keep in mind when you're perusing prices that there are separate charges per person, for the site itself, for the tent, and for the car, (though the car and plot—called "piazzola" in Italian, often come packaged together under one price) so that €5 price tag ends up ringing in more around €18 to €32 for two people car camping with a tent—and that the highest prices are applied in July/August. Many campgrounds are seasonal, shutting down from late September/early October through Easter-ish. Many campgrounds also offer bungalows in case you didn't BYO tent. These run €50 to €100 (as high as €200 in popular areas in July/August). For RVing, caravaning, and campervans, see the special RV page. Italians call campground either campeggi or campings. There are more than 1,700 official campgrounds scattered across Italy. The local tourist office always keeps a list of area campgrounds. There is an obscene number of camping-related sites in Italy. Note that in many cases, the sites are only available in the native language, but most are pretty easy to navigate regardless: click on the map where you want to go, you get a list of campgrounds with phone numbers addresses, web links, sometimes pictures and prices...so what if you can't read the blurb of accompanying text? HostelWorld.com (www.hostelworld.com) - I know what the name says, but it also books campgrounds—and has the benefit of being in English. Touring Club Italiano (www.touringclub.it) - Italy's version of AAA. Nothign online any longer, but once you're in Italy, you can buy their excellent camping guidebooks at any bookstore. Campeggi e Villaggi (www.campeggievillaggi.it) - A privately-run database of Italian campgrounds. Campeggio.com (www.campeggio.com) - Pretty complete database, in Italian, but click on a region, then a province (major city/town) for a list of local campgrounds in no particular order. They offer on-line booking ("richiedi disponibilità") but also provide direct links to individual campground websites. Odd, infuriating drawback: the links are not hotlinks; they're just the text, so you can't click on them. You have to cut-and-paste them into a browser window address field. Idiotic. 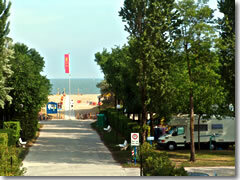 Camping.it (www.camping.it) - More Italian campgrounds. Big benefit: it's in English. CamperOnline.it (www.camperonline.it) - In Italian (though you can get an English version of the menu—though not the content), but choc-a-block with info on camping and RVing all across Europe, including hundreds of country-specific links to tons of other useful Internet resources, free sites to park your RV, and on-line camping catalogues. 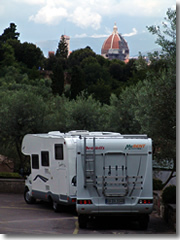 Camping Italia.it (www.campeggio.it) - Another online booking engine for Italian campgrounds. Federcampeggio (www.federcampeggio.it) - The Federazione Italiana del Campeggio e del Caravanning is a camping and RVing club with discounts for members. It's in Italian—and, unfortunately, they prefer to sell you a book of campgrounds rather than provide an online database—but there is some good intel in there for nudists and RVers. Click first on "Buona Navigazione", then on "In Vacanza." On this page, you'll find a list of "Campeggi" (first is Campeggi Convenzionati" which just means campgrounds that offer members a discount. If you're feeling racy, the "Per Naturisti" section lists nudist camps. "In Croazia" are campgrounds in neighboring Croatia. The section "Aree di Sosta" contains lists of official places where RVers can park their motorhomes (click on the second one, "Aree di Sosta in Italia" for a complete list" by region).